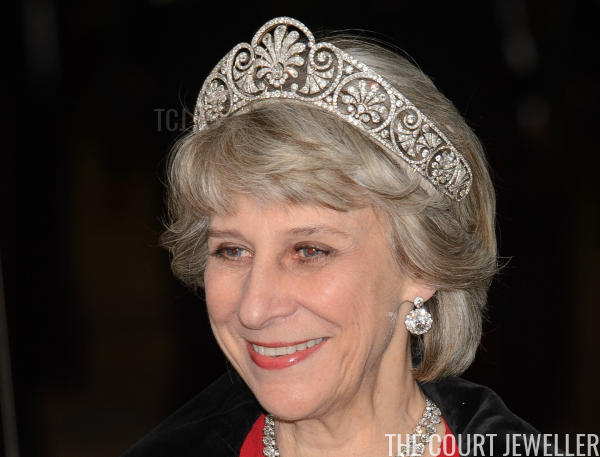 Below is a list of the tiaras worn by the women of the British royal family's Gloucester branch; it includes only the tiaras currently worn by the family, not historical tiaras or tiaras whose ownership is currently uncertain. Click on the title of the tiara to be taken to pages with fuller histories, large images, and much more information. Enjoy! Photo generously shared by Javier. DO NOT REPRODUCE. 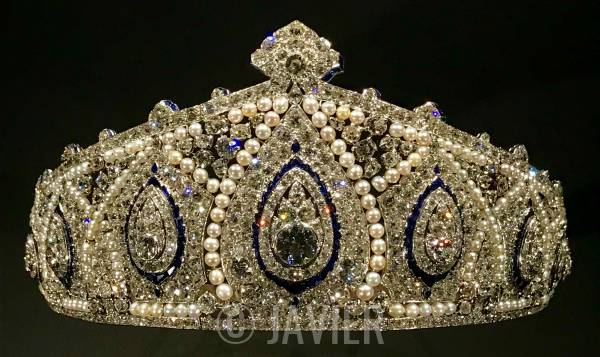 The Cartier Indian Tiara: A spectacular, complex, and densely-packed tiara set with diamonds, pearls, and sapphires, inspired by traditional Indian design motifs. Made at some time between 1906 and 1921 by Henri Lavabre at Cartier for Princess Marie Louise of Schleswig-Holstein. Bequeathed in 1956 to her godson, Prince Richard, Duke of Gloucester. Worn by Princess Marie Louise and the present Duchess of Gloucester. The Gloucester Diamond and Emerald Bandeau: An Art Deco-style jeweled bandeau, which can be worn in either all-diamond or diamond and emerald settings, with sections able to be removed and worn as clip brooches. Given to Princess Alice, Duchess of Gloucester in 1935 as a wedding present by her husband, Prince Henry, Duke of Gloucester. Worn by Princess Alice, Duchess of Gloucester and the present Duchess of Gloucester. The Gloucester Diamond Laurel Bandeau: A curved diamond bandeau with a central laurel-leaf pattern, rising to a central point, and set with a series of diamond toppers. Given to Princess Alice, Duchess of Gloucester in 1935 as a wedding present by her husband, Prince Henry, Duke of Gloucester. Worn by Princess Alice, Duchess of Gloucester. 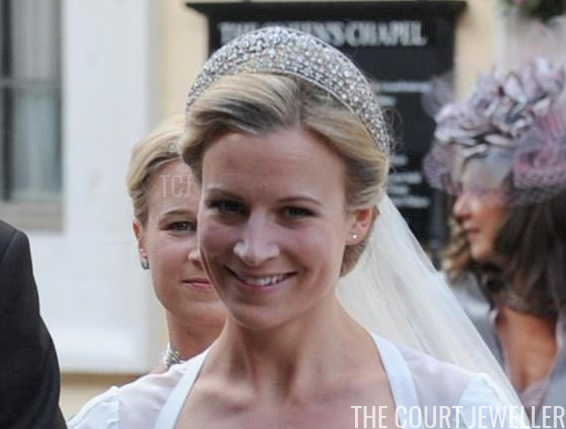 The Gloucester Diamond Necklace Tiara: A necklace of floralesque diamond clusters, able to be set on a diamond frame and worn as a tiara. Worn by Princess Alice, Duchess of Gloucester and the present Duchess of Gloucester. The Iveagh Tiara: A lacy diamond kokoshnik featuring delicate leaf designs. Presented to Queen Mary in 1893 as a wedding gift by Lord and Lady Iveagh. Bequeathed to Princess Alice, Duchess of Gloucester in 1953. Worn by Queen Mary, Princess Alice, Duchess of Gloucester, the present Duchess of Gloucester, and Lady Rose Gilman. Worn as a wedding tiara by Lady Rose Gilman (2008). Queen Mary's Honeysuckle Tiara: A balanced diamond tiara featuring prominent honeysuckle and scroll designs, able to be worn with a trio of central elements: a diamond honeysuckle, a diamond and kunzite ornament, or a diamond and cabochon emerald ornament. Commissioned by Queen Mary from Garrard in 1914 and made for the firm by E. Wolff and Co. using diamonds taken from the dismantled County of Surrey Tiara. Originally featured a taller central section, which was later lowered; also originally able to be worn with two other central elements, a sapphire and diamond cluster and the Cullinan V Diamond. Given by Queen Mary to Princess Alice, Duchess of Gloucester. Worn by Queen Mary, Princess Alice, Duchess of Gloucester, and the present Duchess of Gloucester. The Teck Turquoise Tiara: A grand diamond and turquoise tiara of floral and scroll designs, accompanied by additional jewels to form a married parure. Originally a nineteenth century creation, given by the Duke and Duchess of Teck to Queen Mary as a wedding present in 1893. Height and proportions of the tiara reworked by E. Wolff and Co. (for Garrard) on Queen Mary's order in 1912. Given to Princess Alice, Duchess of Gloucester as a wedding present in 1935. Worn by Queen Mary, Princess Alice, Duchess of Gloucester, and the present Duchess of Gloucester. 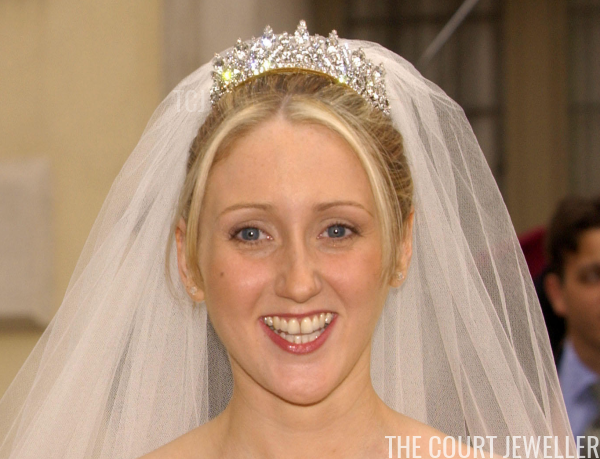 The Ulster Wedding Tiara: An all diamond tiara that rises to a series of points. Worn by the present Countess of Ulster as a wedding tiara (2002).